Two years ago, after leaving our careers and selling most of everything we owned, my wife and I retired early to Costa Rica. Our life in Dallas, Texas was busy and stressful. After looking at our options, we chose to move to a foreign country, to live more simply and have time to pursue our passions. There is an oft-told joke in Costa Rica that if you don’t like the weather just move down the road. Costa Rica has a climate for just about everyone. Just about any weather you would want is available here…except snow. Whether you like tropical weather and beaches, or spring-like weather and lush valleys…Costa Rica really does cater for everyone. We decided to make our new home in the mountains surrounding the small farming town of Grecia. We live at an elevation of 4,700 feet, about eight miles from Grecia proper. This elevation provides us with perpetual springtime temperatures with year around highs of 80 F and lows of 60 F. Many towns in the Central Valley of Costa Rica share this incredible weather. If sun with a side of ocean breeze is more your style, there are many beaches—either on the Pacific coast or Caribbean coast—to choose from. 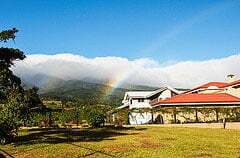 Or for a little bit of both climates look at the mountains of San Isidro de General in the Southern Zone, where you can get the cooler temperatures of the mountains but with close proximity to many wonderful beaches. Long workdays, weekends with packed schedules, hurried lunches, and interrupted dinners…this is how my wife and I lived for many years. Chasing the American Dream is also how we got burned out. Although we were used to a fast-paced lifestyle, we have come to embrace and enjoy the slower way of life in Costa Rica. The pace of life is not the only aspect of our lives that has changed from the States. One of the reasons we can afford our early retirement is because we take advantage of the cost savings in Costa Rica. In Grecia, Costa Rica you can rent a furnished three-bedroom home with a view for as little as $625 a month. Renting our home here in Grecia is much cheaper than we could have ever found in Dallas. We found it by networking with friends to find the best deal. And what a deal it is. For $625 a month, we rent a furnished three-bedroom, two-bathroom home that has an incredible view. Fresh fruits and vegetables are much less expensive here than in the States…and we are eating more of them. As a result, we eat much less processed and prepackaged food, so not surprisingly our health has improved. We also save money on transportation living here. Owning a vehicle in Costa Rica can be expensive, but luckily public transportation is safe, cheap, dependable, and frequent. 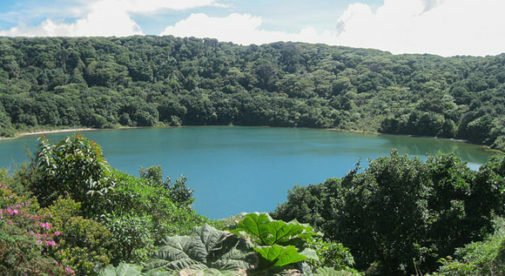 Another feature of Costa Rica that makes us love living here is the natural beauty that surrounds us. Costa Rica represents only 0.03% of the earth’s surface yet it contains nearly 5% of the earth’s plant and animal species. One of our requirements when choosing a place to live here was that we had to have a view. Thankfully, that’s not a problem here. Here in Grecia we get a panoramic view of the Central Valley, from the national stadium in San José to our neighboring town of Sarchí. In addition to the sense of awe inspired by the mountains, we get to enjoy flocks of parrots that fly by our house each morning, the occasional toucan, as well as many other bird species. And if we want to see more animals, we just take a trip to one of the many national parks where we can see monkeys, sloths, and many other animals. Finally, we love Costa Rica because of the people. Assimilation into the country has been made much easier because of the kindness and helpfulness of the Ticos (as the Costa Ricans call themselves). Our first week in our new town we were riding a bus towards home. It was raining, the windows were fogged, and we had not yet learned to pick out an appropriate landmark at which to pull the cord for our stop. An older Tica asked us in mixed broken English and Spanish if we needed help. Our new friend peered out the window with us and was generally a calming force telling us everything would be ok. This is just one of the many ways in which we’ve been made to feel welcome in this foreign place. Each one of these reasons is enough to fall in love with Costa Rica, but combined they are a powerful pull for living here.